Five improvised compositions by Malasian-born cellist/pianist Junyi Chow and South Korean-born flutist Seungmin Cha. 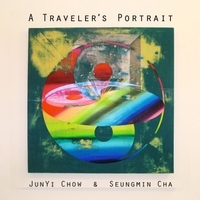 “A Traveler’s Portrait” explores links between soundscape and expression featuring Seungmin Cha on Daegum and JunYi Chow on Piano and Cello. Two composer performers shall exchange musical ideas and create an experimental dialogue that crosses the boundaries between traditional and contemporary, silence and noise, preconception and innovation. Emerging as one of the most influential experimental Daegeum (Korean transverse bamboo flute) artists, Seungmin Cha was trained in traditional music and its discourse. Her performances incorporate traditional (jeongga and minyo), indie, experimental elements. You can see the evolution of Gugak (Korean traditional music) through her as a traditional music performer, who is at the same time, a contemporary composer and independent musician in the underground scene. Malaysia-born New York-based Composer, Multi-instrumentalist and Improviser. Chow's music has been lauded by Financial Times for its "skilful contrasts in both volume and texture". His interest in music explores the indefinite possibilities of tone colour and sound, in featuring a mixed musical style based on classical contemporary music, Chinese tunes, Gamelan music, minimalism, and popular music, amongst other influences.